Since the Renaissance, the remains, myths and visual representations of ancient Rome have influenced not only European culture but also the architecture and urban planning of the big cities of Europe and of the Americas through the process of colonization. The University of Caen Basse-Normandie (France) has a famous visual representation of ancient Rome in the scale model of Paul Bigot, a French architect who lived at the beginning of the 20th century. This exceptional part of our cultural heritage has been the pretext for a virtual reconstruction of ancient Rome. The technologies used and, in particular, the interactive visit with access to ancient source materials give a new life to the myth. Our team has developed a fully interactive model of ancient Rome which allows a visitor to move freely in a full-scale city and enter the main public buildings as well as some private apartments. The aim is both scientific and didactic. Scholars can use the model as a regularly updated database for reference and possible experiments. The general public can visualize a world that is now beyond their reach. 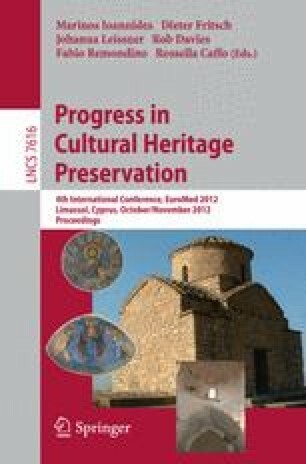 This paper will focus on a particular example: the temple of Venus and Rome in its condition as of the 4th century A.D.